6.33 points at 6 votes (rank 562). 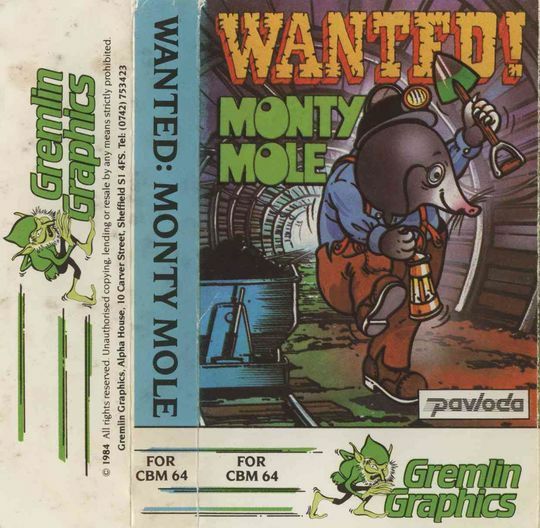 Monty Mole (also: Wanted! 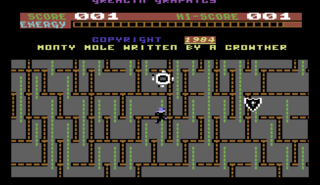 Monty Mole) is a jump'n'run game of the most difficult kind, that needed approx. 3 months of development. Starting in the garden, everything is full of perils. We collect pieces of coal and flee from evil boiled sweets, scurry under stampers at the right moment. Touching all the evil things quickly subtracts you energy. When all the energy is lost, the game ends. A "box of worms" fills up the used energy. Glittering protective shields give you a respite. 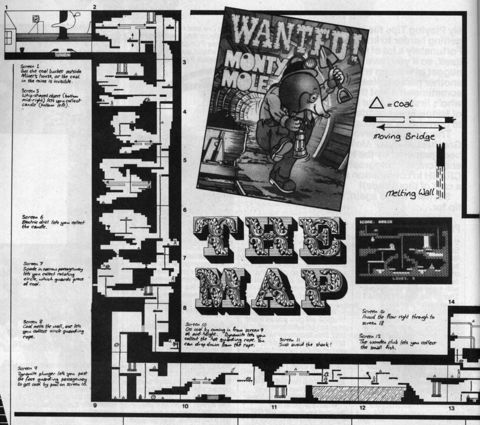 The ways to die or respectively to lose energy points in this underground adventure game are manifold: toxic mine gas, flying poles, deadly hair spray, coal breakers (stampers), coal trolleys, coal conveyors (rotating saws), mine workers that throw helmets after you, acid baths, candles, bats, falling down from great heights, jumping, moving and falling items and animals etc. A tin bucket and collecting pieces of coal each give you one point for the highscore, whereby there is a maximum of 13 points per level. When the energy is empty, then a R.I.P. appears before the options menu is shown again. Nice graphics for that time. 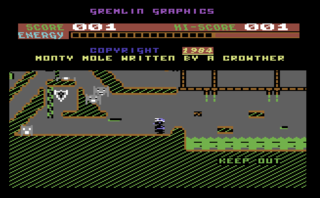 Written hints are built into the graphics. With the key F1 you can choose the difficulty grade EASY or HARD in the title screen. The game is started with the key Space . Worf: "The game is good but difficult. I loved it. 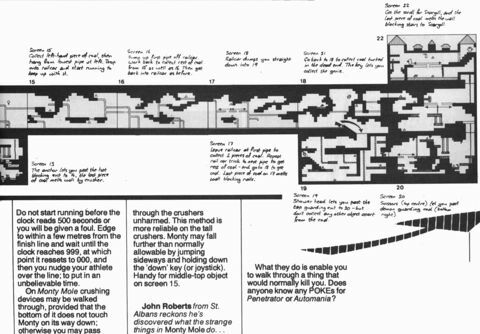 However, I ask myself today how I could have played THIS game until section 8, without emulator, without savegames. Well, then someday Monty on the Run was released and really everybody was crazy about that!" Jodigi: "An interesting game, that keeps you occupied for a long time..."
FXXS: "I think the music is only bearable on the long run with a bitter... I also personally find it too confusing that I would want to play it for a longer time. 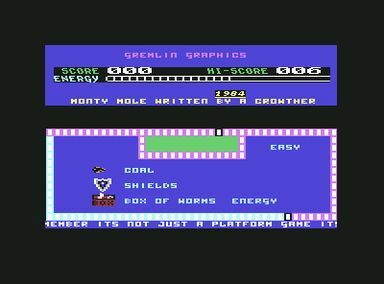 7 points'"
If you try to start Monty Mole with the x64.exe of Vice, you will get bad graphic bugs. Simply start with the x64sc.exe, which emulates the C64 more precisely, then it will run without problems. This page was last modified on 1 March 2019, at 22:41.